Whitey is a young male beagle entering his first rabbit season. It has been a lot of fun working with him during the off-season and we have been looking forward to finally getting to hunt over him! 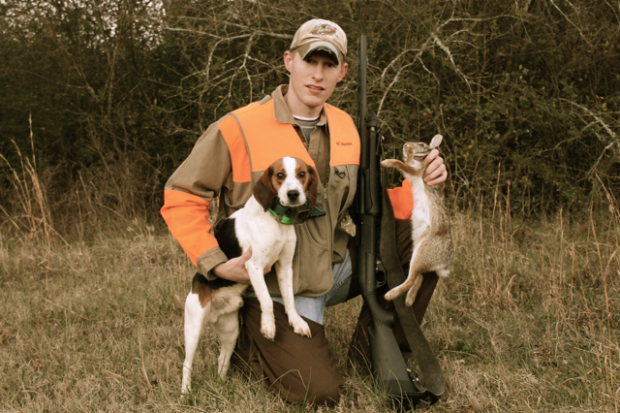 This past weekend we were able to kill the first rabbit in front of him – Whitey earns the title of Gun Dog! I reflect over several milestones in Whitey’s training. Whitey started running with little effort (“started running” for those unfamiliar with the term is when a beagle starts using their nose to track. Often they progress from sight chasing rabbits to using their nose to track.) I remember well the afternoon he started running – my little boy and I had Whitey out of the kennel and were looking to put him on a rabbit. Having already had 3 or 4 sight chases under his belt, I walked Whitey over to a rabbit I had seen on the edge of a cut hay-field. He soon spotted the rabbit and took off after it running it into the nearby treeline. We watched as Whitey paused for moment looking into the brush where the rabbit had disappeared. Thinking he might once again turn and come running back to me, I watched as he suddenly put his nose to the ground and dove headlong into the treeline giving plenty of mouth as he scent tracked his first rabbit! 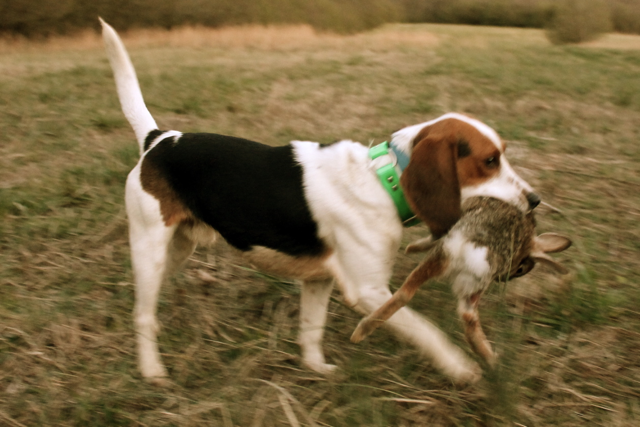 He ran the rabbit only about 75 yards, but I couldn’t have been more proud…and excited! 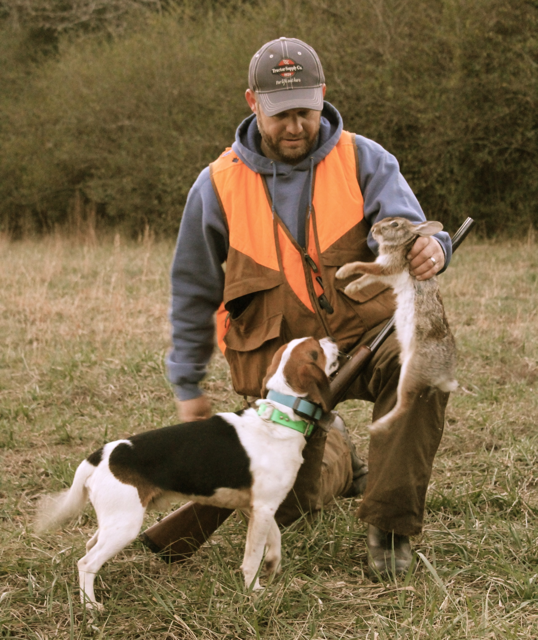 Another milestone for a young beagle is the first time they jump and circle a rabbit running solo – completely on their own. Depending on the time of year and the amount of opportunities I have given a young dog, I fully expect them to be able to jump and circle their own rabbit before they are a year old. Whitey reached this milestone at about 9 months old. I ran him solo quite a bit as a puppy and by the time he was a year old, he was able to push rabbits around the farm by himself with ease. The next accomplishment for Whitey was to run in a pack with 3 or 4 hard-hitting, experienced hounds. Often I find that a young hound gets frustrated running with experienced and strong dogs. I first dropped Whitey on the ground with a big male named Crockett. After about an hour of watching and listening I was convinced Whitey was able to hold his own. I then added two more big males, Jack and Driver to the pack and the intensity and drive of the race increased. Whitey continued to stay in the races and handled the pressure well. Some young dogs advance through this step without missing a beat. 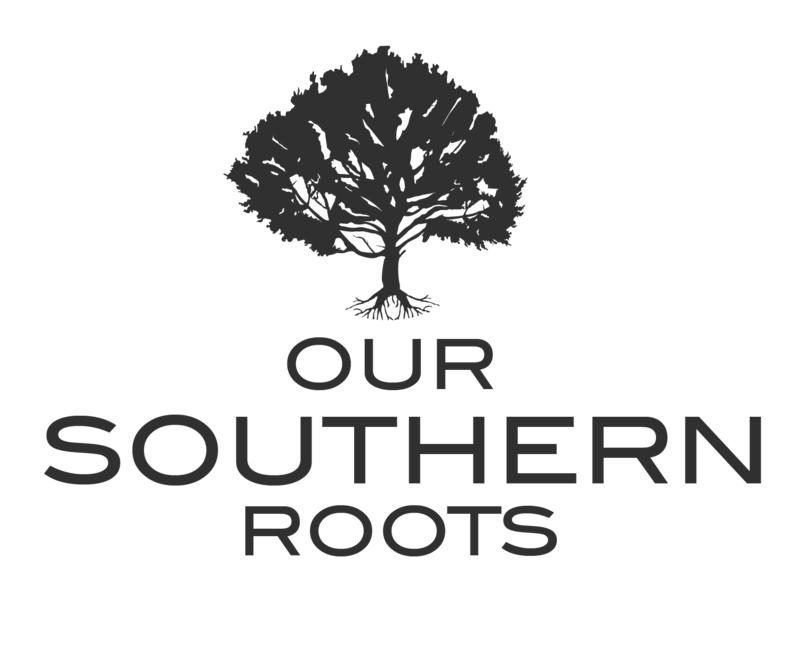 Others do not handle the pressure and competition very well and either get discouraged and quit the race, or are overwhelmed and “crack up.” I have seen first hand a few young dogs start acting crazy when they couldn’t handle the pressure of an experienced pack. Evaluating a hound under the gun is always the true test of their ability. Just last week Ike and I took to the field with a pack of six hounds including Whitey. 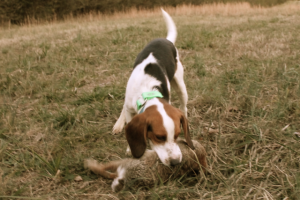 The goal was simple – get Whitey his first rabbit! We worked the hounds through a dry pond filled with briars. Soon after entering the pond, Ike starting whooping as he kicked up a rabbit. Captain Jack was the first dog to hit the track and soon all the dogs had piled on the line. Listening to six hounds on a hot track is always an awesome sound! The rabbit ran up a hill for about 200 yards and we split up to take stands as we heard the pack turn and start back in our direction. I thought for sure, I was in the right spot as the dogs approached, but at the last second they veered and headed for Ike. A few moments later I heard Ike’s shotgun but he came across the radio saying he had missed the streaking rabbit. As the pack went into their first check, we set up again and waited. It wasn’t long before Maggie sorted things out and the race was back underway. After another big circle without getting a shot opportunity, Ike and I ended up standing together expecting the rabbit to be pushed through a neck of woods between a field and the river. As the pack grew louder heading in our direction, I could pick out Whitey’s voice and knew it wouldn’t be long before we had his first rabbit. The rabbit suddenly appeared slipping through the woods and this time Ike dispatched him with ease. The pack was not more than 10 seconds behind the rabbit and we ran to meet Whitey at the dead rabbit. We spent quite a bit of time praising Whitey and letting him mouth the rabbit and pull fur. He was excited! I am confident that this is only the first of many, many rabbits Whitey will drive to the gun during his career!